Not everyone lands their dream job right out of school. The story of how Aditi Bhargava did it involves careful planning, help from a professor and a lucky salmon-pink blazer. For years she had wanted to learn design thinking – how to improve products and services with experimentation and by putting yourself in consumers’ shoes. She hoped to work for Google but thought a bachelor of arts wasn’t enough to get her there. “Anyone who wants to work for a big tech company like this needs to realize it doesn’t happen overnight,” she says. She applied to University of Toronto’s master of information program, specializing in knowledge media design (which was revamped last year into the user experience design concentration to reflect changes in the industry). The two-year program mixes theoretical and practical lessons in design for platforms ranging from mobile to wearables and 3D interfaces. The training is meant to mould students into marketable UX designers or researchers by graduation. Bhargava’s friend and classmate Yashvi Shah knew Aditi had her work cut out for her if she wanted to be hired by Google (now a subsidiary of Alphabet). “It’s kind of like dropping your application in – not even a pool – an ocean,” she says. One of Bhargava’s first steps was to make a “milestone plan,” a roadmap for the next three years. “Naturally we wondered about what we would do after our master's,” Shah says. “The world was our oyster. 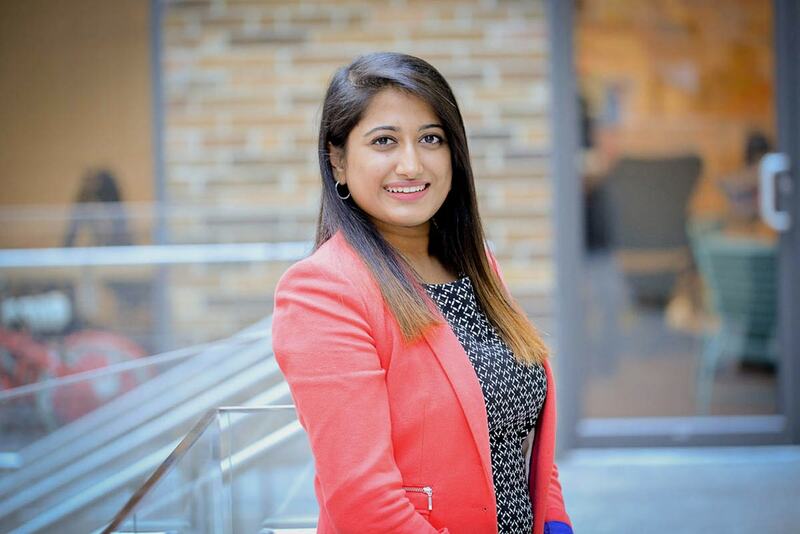 There were so many opportunities, but picking the right one at the right time is so important.” Bhargava put a date to her ambitions to join Google: spring 2017. Then she got to work. “I applied my own UX design and prototyping philosophy to the application process,” Bhargava recalls. Using the design principles she had learned in class, she “ideated” what she would talk about in an interview (her projects, strengths and values), sketched notes and storyboarded her presentation. Her first test came last fall when she had two rounds of phone interviews with Google managers and designers. “I thought this is so wild because Google has always been my moonshot job,” she says. Her faculty mentor Olivier St-Cyr, an assistant professor, teaching stream, helped her prep for the interview during office hours by telling her what questions to expect: How would you describe your design thinking process? What technologies did you learn? And how is your program relevant to the job? Bhargava isn’t allowed to describe the interviews in detail, but says the recruiters posed many questions based on case studies. “You have to be ready to be tested at any point,” she says. She had a good feeling after the first hurdle, but heard nothing from Google for months. Just when she was about to start looking for other jobs, she received an email from the company inviting her to Google HQ in California for a presentation and full-day interview. Again she consulted St-Cyr for advice and a UX portfolio review. “You have to tell a story when you present your portfolio,” he says. In February, she packed her interview outfit for the big day in Mountain View, Calif.: black jeans, a white tee, sneakers and salmon-coloured blazer that she had worn to the interview that helped her get her first-ever job. “It didn't feel like the typical (interview) outfit that people on the internet would advise, but it was comfortable,” she says. In her meetings with Google recruiters, she emphasized a capstone team project she did with the MaRS Discovery District, a UX review and redesign of their online resources for budding entrepreneurs and startups. “Working at MaRS really opened up my eyes to how innovation works,” Bhargava recalls. Weeks later, she was in class at U of T’s iSchool when she received another call from Google. She stepped out with her friend Shah to take the call. Bhargava joined a Google team responsible for researching communication products including Android Messages and Dialer. She travels around the United States conducting interviews and leading focus groups, looking for ideas to build the products' global popularity.